Founding Dean Dorothy Smith coined the phrase “knowledge-based clinical excellence,” a concept that is now being used in the new undergraduate curriculum. 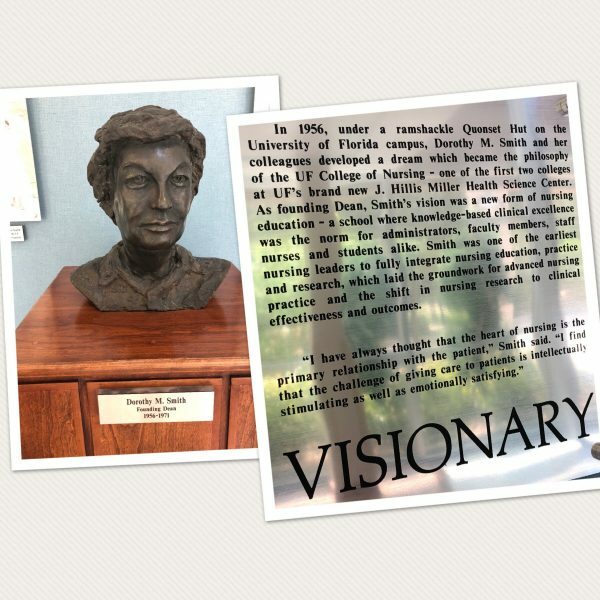 The landscape and science of health care is constantly evolving, and as members of the largest health profession in the United States, nurses must learn to grow and evolve as well. To ensure Gator Nurses are prepared to enter this changing environment, the College of Nursing faculty and administration embarked on a 14-month journey to transform the Bachelor of Science in Nursing curriculum. The new curriculum, which has been approved by the University Curriculum Committee, were implemented this fall for the incoming junior cohort. Courses within the curriculum were developed using the concepts from the college’s tripart motto: Care, Lead, Inspire. Throughout each semester, students are educated as nurses who embody the concepts of caring, leadership and inspiration. 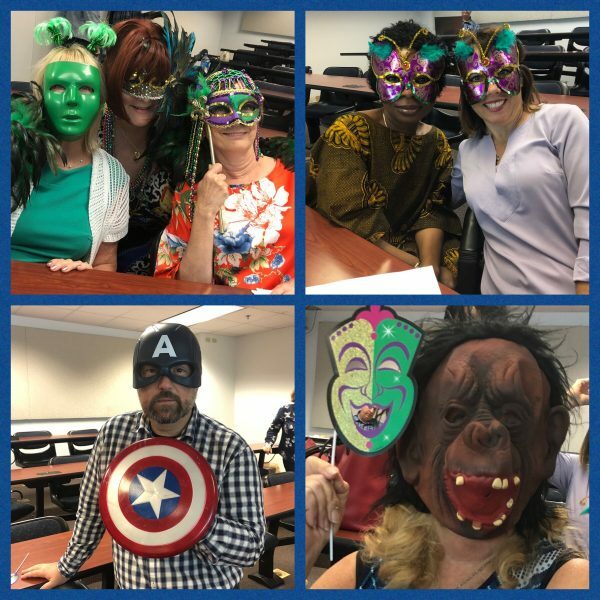 CON faculty wear their favorite masks during the workshop to “unmask” the new curriculum. As the associate dean for academic affairs, Brian Holland, Ph.D., R.N., is responsible for ensuring the success of the new curriculum. Although his appointment within the college is fairly recent— as of May—Holland has been integral in the final curriculum implementation phase and is charged with maintaining its accuracy and authenticity each semester. The impetus to revise the BSN curriculum came from a three-year national study funded by The Carnegie Foundation for the Advancement of Teaching. This study called for a “radical transformation” of nursing education. Four “essential shifts” were recommended for how nurse educators think about preparing pre-licensure nursing students for the increasingly complex nature of professional nursing practice. The first called for a shift from “decontextualized” knowledge to using knowledge in practice. The second shift called for eliminating the separation of clinical experience and classroom content to integration of knowledge and skills. Thirdly, critical thinking should evolve to clinical reasoning. And the last shift involved moving from role socialization to identity formation as a professional nurse. To tackle the development of the revised curriculum and implement these four shifts in thinking into the courses, a leadership group of seven faculty members from across departments and ranks was created to form the Curriculum Transformation Team. Numerous all-faculty retreats were held throughout the year and multiple faculty work groups convened to revise the college’s foundational documents, analyze the current best evidence in nursing education and pedagogy, articulate the vision for the “ideal graduate,” and identify end-of-program outcomes. The Curriculum Transformation Team championed the meetings and led the faculty through course creation and the overall curriculum plan. Once the new curriculum was approved, a new group of faculty formed to create the Curriculum Implementation Team to lead the faculty through implementing the new courses. Associate Professor Paula Delpech, Ph.D., R.N., ARNP, was the co-leader of the Curriculum Transformation and Implementation Teams. Samantha Bayer is a junior and the first cohort to be instructed in the new curriculum. 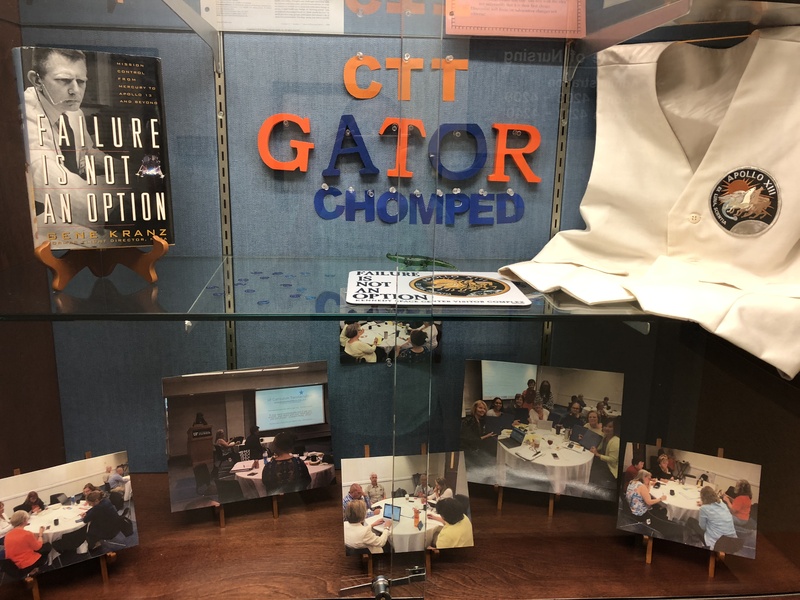 A display case at the College of Nursing showcases the curriculum transformation process and items of inspiration used during faculty curriculum workshops. Seniors in their final year of the BSN program will continue with and graduate from the “Legacy Curriculum,” which was implemented in fall 2010. The Legacy Curriculum emphasizes health promotion, prevention and interprofessionalism. Building on the Legacy Curriculum, the new Care, Lead, Inspire Curriculum is founded on the concept of personalized nursing care and will prepare students to perform well as an integral part of interprofessional teams in order to maximize the efficiency of the health care delivery environment, Holland said. “The students will engage in active learning strategies throughout the curriculum to ensure that they are obtaining the knowledge, skills and professional attitudes to deliver personalized nursing care,” he said. The new curriculum is logically organized from simple to complex so that students acquire the cognitive, affective and technical competencies of a professional nurse. Courses in the first two semesters focus on foundational knowledge and principles of personalized nursing care. Students gain an understanding of the context of contemporary nursing practice, the meaning of professionalism, ethical and legal guidelines, professional values and standards of professional nursing practice. Course content and concepts are closely aligned with clinical experiences to develop beginning clinical reasoning. Students acquire the knowledge, skills and attitudes to provide evidence-based, safe, cost-effective quality care to achieve optimal health outcomes. Courses in the final two semesters build upon prior learning and are characterized by increased complexity in content and outcomes. Students enhance clinical reasoning and critical thinking through nursing practice in a variety of settings for individuals across the lifespan, families and other groups, and communities. Learning experiences are designed to enable students to demonstrate leadership, interprofessional collaboration and advocacy skills that improve the health of diverse individuals and populations. In the final semester, students participate in a project to develop an innovative solution for a problem or issue relevant to professional nursing. “The culmination of this entire effort is the design of a student-centered curriculum that is focused on how nurses care, lead and inspire others to achieve desired nursing, health and system outcomes,” McDaniel said.